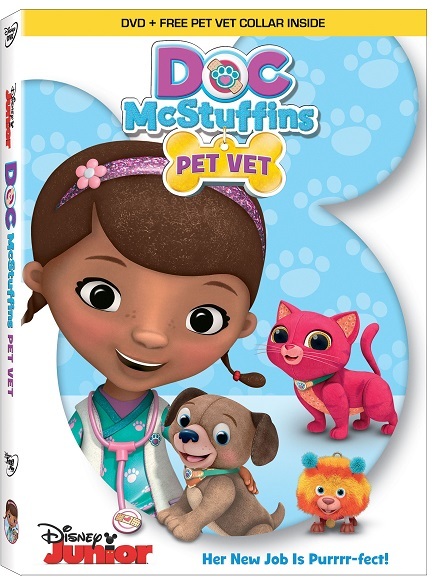 Award-winning Doc McStuffins will be releasing a DVD November 3rd featuring the backyard Pet Vet helping toys in need. Winner of the Peabody Award for promoting compassion, confidence and creative problem solving through their children’s show, Doc McStuffins helps children to more familiar and comfortable visiting the doctors office, a very common fear among young children. It also touches on the subject of injuries that cannot be cured, helping littles to better understand and accept people differences and disabilities. From a personal point of view, I think it’s important for my little girl to see girls/women of color in compassionate and problem-solving roles. Studies have shown that one of the ways that people motivate themselves to achieve goals is to find a role model that they relate to. Doc McStuffins is a perfect role model for little girls that already enjoy role playing with their stuffed animals and toys. Add in these free activity sheet printables and your little one is sure to have an afternoon of imaginative and compassionate fun with Doc McStuffins. Pick up the special 5 episode DVD with free pet collar starting November 3rd. Freelance writer, copywriter & digital influencer, Lydia Hernandez, aka The Vintage Mama, started blogging in 2008. Now a single mother to four children and a psychology major at California Baptist University, Lydia is also a frequent guest writer for blogs and magazines, and is currently working on two historical fiction novels.